When the heat is on outside, it’s time to cool down the kitchen with a crisp Mexican style salad. I’m turning this one into a full fiesta with tomatoes, black beans, and charred corn. 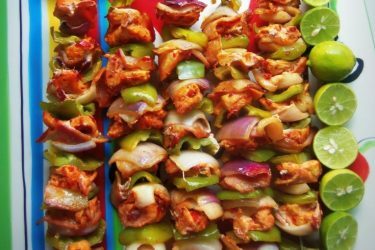 Adding chunks of chicken grilled with a lime fajita marinade makes it feast-worthy when you’re feeding a crowd. It’s easy to put together and pretty when you’re ready to serve it. 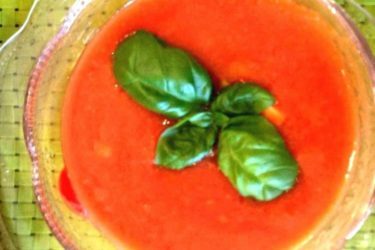 This recipe can become a full lunch meal or served as a side with dinner. 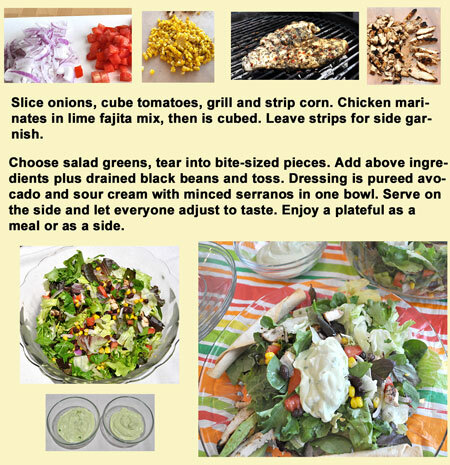 The great topper here is a dressing blend of sour cream, avocado, and minced serrano peppers. Yes, you can leave out the serranos or replace them with milder bells. Or, you can provide two different options – with/without. Serve the dressing in bowls on the side so everyone can adjust to their own tastes. For lettuce, I’ve shredded iceberg with a spinach and spring mix (the pre-bagged kind) for added flavor. You can, of course, use any variety. At the end of this recipe, you’ll find my personal lime fajita marinade. Just double or triple it when you’re making classic Tex-Mex chicken fajitas (for beef, substitute tequila for the lime). – 1 bag mixed greens. – 1/2 head iceberg lettuce, shredded into bite-size pieces. – 1 ear of corn, grilled with kernels removed and chilled. – 1 cup black beans (8 ozs. canned), drained, rinsed, and chilled. – 1 Roma tomato, cubed, seeds removed, and drained. – 1/2 red onion, cut into short strips. – 1 boneless, skinless chicken breast, butterflied, marinated, grilled, and cubed. Reserve a few strips for serving on the side. – 2 avocados – 1-1/2 pureed; the remaining half sliced for serving at the side. 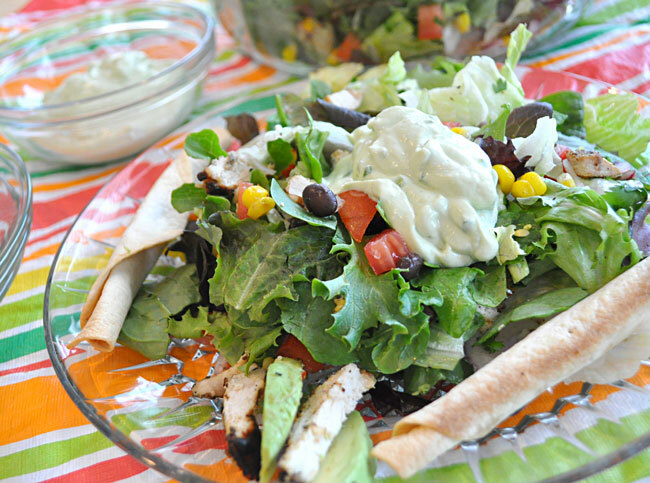 –Toss all ingredients for the Salad Mix in a large bowl. Place damp paper towels on top, then seal with plastic wrap until ready to serve. You can also keep leftovers fresh this way. — Blend wet ingredients and pour into baggie to cover. — Marinate for 1 hour before grilling.